Someone once said that there is nothing new under the sun, and this includes historic reenactment. There were two magazines published in 1958. THE SAPPER from June 1958 and THE SOLDIER from July 1958. "Shades of 1858", says the article from THE SAPPER magazine, Vol. 5 No. 1 from June 1958, "complete with side whiskers! Six lucky Sappers who are attending the British Columbia centenary celebrations." Across the top of the arch behind them it says: "THE CORPS OF ROYAL ENGINEERS TO THEIR COMRADES WHO FELL IN THE WAR WITH RUSSIA MDCCCLIV-V-VI"
And underneath "UBIQUE QUO FAS ET GLORIA DUCUNT UBIQUE"
To mark the pioneers work done by the Royal Engineers during these days which the province is now commemorating the Corps Committee has arranged , at the request of the British Columbia authorities, that one officer and five O.R.s, uniformed and armed as for 1858, will participate in the various centennial celebrations in conjunction with a similar party in modern dress from the Corps of Royal Canadian Engineers. In addition the Corps is to present to the City of New Westminster an enlarged replica of the Corps badge. This plaque will be hung at the entrance to the City hall and will serve to remind all who pass of the longstanding association between the 'Royal City' and the Royal Engineers. Since the main events take place during the summer months, the party arrived in B.C. early in May. They are stationed at the Royal Canadian School of Military Engineering, located in the same Chilliwack country surveyed almost 100 hundred years ago by Captain Parsons and his small party. 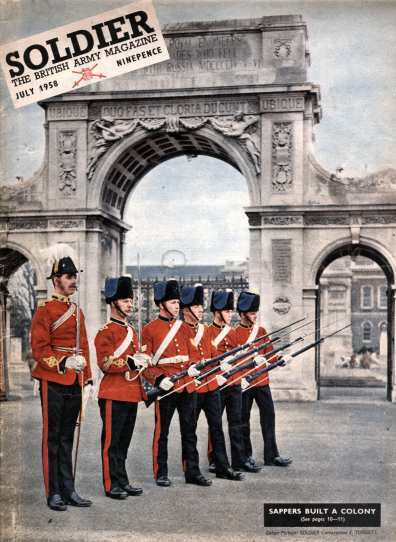 From there, joined by a similar detachment from the Corps of Royal Canadian Engineers, but uniformed and armed for 1958, to emphasize the continuing Sapper tradition, and accompanied by the band of the Royal Canadian Engineers in pre-war scarlet, they sally forth to take part in the province of British Columbia's Centennial. By this joint effort it is intended not only to reflect the work of the Royal Engineers in the early days, but to illustrate the fact that although the Corps left the province some 50 years ago, its work has, and is being perpetuated and carried forward by its offspring, the Corps of Royal Canadian Engineers. Sappers crossing the square of the 150-year-old Brompton Barracks rubbed their eyes in disbelief. There, drilling in a style Brompton has not seen for nearly a century, was a party of Sappers resplendent in scarlet tunics and black busbies with their plumes, and armed with Lancaster percussion rifles. As the men passed their officer, who was wearing a cocked hat, the sergeant saluted with his left hand! But this was no dream and the figures were not ghosts. They were Sappers completing a three-week course with 10 trades Training Regiment at Chatham, learning how to drill in the style of the 1850s, how to clean percussion rifles and to make their own cartridges. Captain G.R. 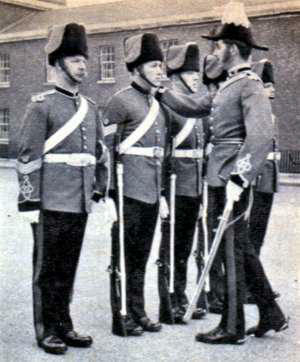 Gathercole inspects his men at Brompton barracks before the detachment flew to Canada. Below: Drill, 1858 style. Left to right: Captain Gathercole, Warrant Officer W. Foster, Sergeant D. Tucker, Lance-Cororal N. Miller, Lance-Corporal M. King, and Sapper K. Thomas. This apparently retrogressive step by the Royal Engineers was the result of an invitation from British Columbia to send a detachment of Sappers to celebrate the centenary of Canada's most western province which stretches north along the Pacific coast and astride the Rockies to the snowbound vastness of Alaska and the Yukon. Celebrations are taking place throughout the year in British Columbia and the Royal Engineers' detachment, which flew to Montreal and from there to Vancouver in a Royal Canadian Air Force place are staying there until August. Arrangements were made with the Centennial Committee by General Sir Ouvry L. Roberts, Colonel Commandant of the Royal Engineers, who is at present living in Canada. The Royal Engineers were asked to take part in the celebrations because the Sappers were there at the beginning of British Columbia's history. A four-foot square carved and painted wooden plaque--an enlarged replica of the Royal Engineers' badge of 1858--is to be presented by the Corps to the City hall and will serve as a reminder of the long-standing association between the "Royal City" and the Royal Engineers. Led by Captain G. R. Gathercole, the Royal Engineers' party consists of Warrant Officer W. A. Foster of 25 Corps Engineers Regiments, Sergeant D. G. Tucker and Sapper K. G. Thomas of 12 School of Military Engineering Regiment, Lance-Corporal N. E. Miller of 17 Port Training Regiment, and Lance-Corporal M. G. King, School of Military Survey. They were selected by Captain Gathercole on the recommendation of the commanding officers of the various units, the aim being to have as wide a representation of the Corps as possible ( the detachment in 1858 was also a carefully chosen body of men representing every trade and calling that might be useful in setting up the framework of the Colony). For the centenary visit, some uniforms of the period were modified from other old uniforms in the Royal Engineer's Museum and two completely new sets were made to the 1858 pattern. Some clothing, including the busbies and belts, was borrowed from the Royal Army Ordnance Corps. The regimental tailor at Brompton has a busy time producing these uniforms for which the belt badges were cast in the Sapper's workshops at Chatham. 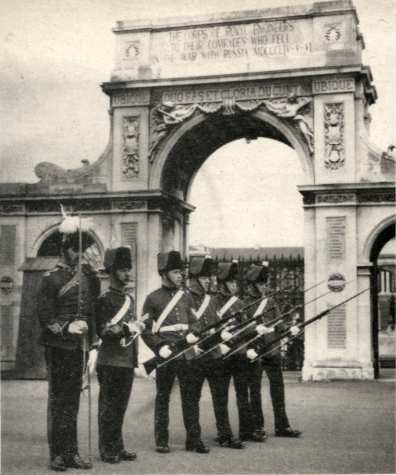 Six Lancaster percussion rifles, bayonets and a scabbard of the exact pattern used by Sappers 100 years ago, were loaned by the Royal Artillery Institution from their Rotunda collection at Woolwich. Other bayonet scabbards were made in 25 Field Engineer Regiment workshops. During their visit to Canada the Sappers are stationed at the Royal Canadian School of Military Engineering, in the same Chilliwack country surveyed by Captain R. M. Parsons, one of Colonel Moody's officers, and his small party of 100 years ago. To read the original articles, please click the appropriate button ,at the very bottom of this page. Your site brought back fond memories for me because during my time in the Royal Canadian Engineers [RCE], while at the Royal Canadian School of Military Engineering [RCSME] at Vedder Crossing [Chilliwack] in 1958, I was fortunate enough to be selected to be a member of the so-called "Old Guard", consisting of soldiers from the Royal Engineers [RE] who had travelled to BC from England, especially to celebrate the founding of the province. A "New Guard" was formed from [other] serving soldiers from RCSME [also named Camp Chilliwack]. Because the RE contingent was short two men, they asked for two RCE sapper volunteers, of English background, which Ken H and myself were from [Leeds and London respectively], and which is how we came to be with the Old Guard rather than the New. We trained in 1858 marching and rifle drill for three weeks [done at a slower pace than today], then spent the rest of that scorching summer travelling throughout the province performing the "Changing of the Guard" ceremony at dozens of settlements from Victoria to Prince George, resplendent in authentic, but stiflingly hot red uniforms of the era and ending with a noisy but crowd pleasing 'feu de joie' fired from genuine 1858 rifles. The drill was usually performed in association with other celebratory events, and so there were usually large crowds each time. 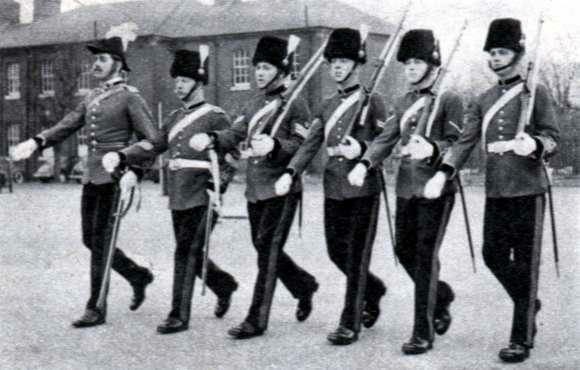 One memorable performance was when Princess Margaret inspected the Guard at Fort Langley. Your article was of even more personal interest to me, because I made my career in the same kind of survey work described in your work. As a matter of fact a number of us 'old military surveyors' are now in the beginning stages of a book that we hope to publish covering the first hundred years of surveying undertaken by Canadian military surveyors, following the transfer of that responsibility from the RE to the Canadian Army in 1903. Despite a gap in time, it should complement nicely, an article such as yours. For those of you on dial-up, the next page has many graphics and will take a bit of time to load but is well worth the wait. Thank you.